• gather testimonies and documents (songs, comics, books, DVDs, etc.) that valorise women. Here’s a list of outstanding women that we’re presenting at our stands. Help us complete it. THANK YOU in advance. 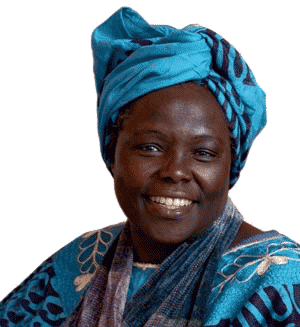 Who was WANGARI MUTA MAATHAI (1/4/1940 – 25/09/2011)? She has risked and suffered beating-ups, trials, prison, death threats, hateful newspaper campaigns, but never used violence, as did Gandhi, Martin Luther King, Nelson Mandela, etc. Let’s thank both Lisa Merton et Alan Dater who co-produced the wonderful movie ‘TAKING ROOT’ and who agreed to put it online (with a free access) in 12 different languages. Such generosity and detachment are rare. NOBEL PRIZE for Peace winning women. 1991, Burma’s Aung San Suu Kyi. Opposed to her country’s dictatorship, the Lady of Rangoon will not cease fighting for peace, despite her confinement. 1992, Guatemala’s Rigoberta Menchú Tum, “ in recognition of her WORK for social justice and ethno cultural reconciliation, based on the respect for the rights of native peoples”. 1997, the American Jody Williams, committed to the fight against anti-personnel landmines and who has managed to gather together six NGOs to create the International Campaign to Ban Landmines, sees her efforts and struggle rewarded. 2004, Kenya’s Wangari Maathai (for her decisive involvement in the planting of 47 MILLIONS trees and the replacement of a dictator by an opening to democracy). 2011, Tawakool Karman of Yemen, Ellen Johnson-Searlef and Leymah Gbowee, both of Liberia, for their commitment in favour of Women’s Rights around the world. 2013, the Iranian Shiri Ebadi, famous for having DEFENDED dissidents. 2014, Malala, the young Pakistani girl from a militant family. She has defied the Taliban in power in her region, by going to school in spite of their prohibition. An act of bravery that the extremists will try to stop by attacking her in 2012. Left for dead, a bullet in her head, the youngster survived and is continuing her fight in the United Kingdom where she currently resides with her family. Hellen Keller A blind, deaf and dumb woman from the USA who has succeeded in communicating through touches in the hand, then in Braille. The dedication of Anne Sullivan, her teacher, was phenomenal! Irène Laure A French woman, one of the main persons in charge of the French-German reconciliation, according to De Gaulle. Solange Fernex An ecologist representative, who has initiated Fasting for Peace in Paris, from 6th to 9th of August, 2012 and has fasted during 2 months against nuclear armament and has fought other struggles. Vandana Shiva A woman from India, labelled the “Indian José Bové”, who, apart from many actions of non-violent resistance, has created a seed bank, similar to Kokopelli, etc. Waris Dirie A woman from Somalia, who has been sexually mutilated and who, after 10 years of hard times, has become a model, and is now dedicating her life to prevent sexual mutilations, forced marriages, etc.